The date of production/manufacture or age of Apollo® Water Heater(s) can be determined from the serial number. 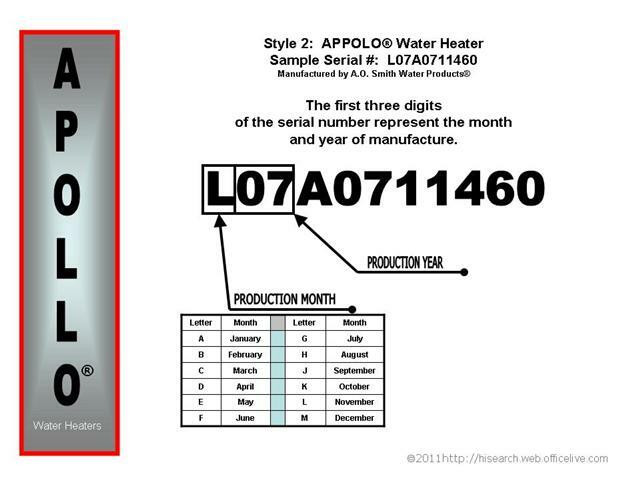 Every effort is undertaken to offer you correct and concise information to assist you in determining the age or manufacture date of water heating equipment. Anytime anyone is dealing with numbers and letters in determining data, mistakes and misinterpretation are bound to happen. For this reason if you find during your research that we may have erred please contact us. In addition perhaps you have come across a brand, model or serial number format that we have not addressed. Email us with your concerns or new submissions. Please include all pertinent information including clear and legible pictures of data/nomenclature plates.